A horn originally had the shape of an axisymmetric cone with a straight boundary. This is optimized with respect to the far-field sound pressure level. 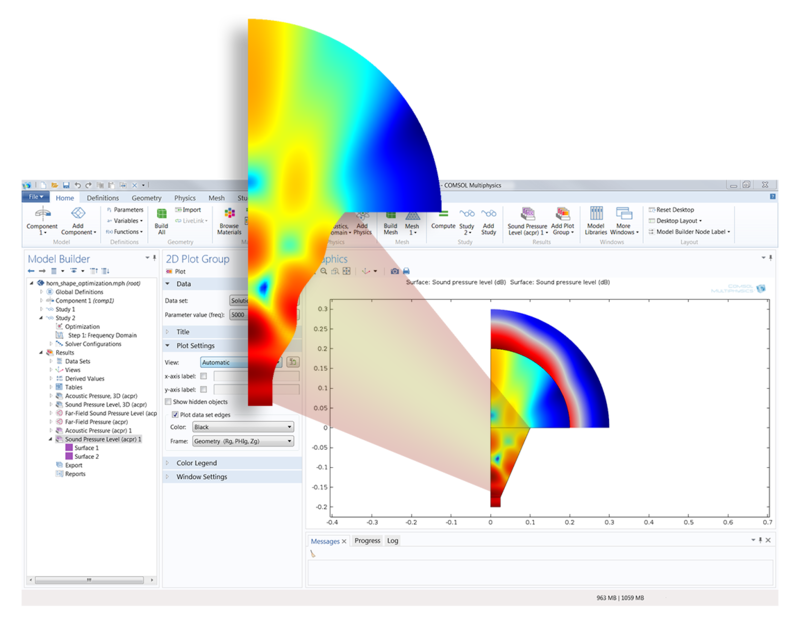 The Optimization Module is an add-on package that you can use in conjunction with any existing COMSOL Multiphysics Product. 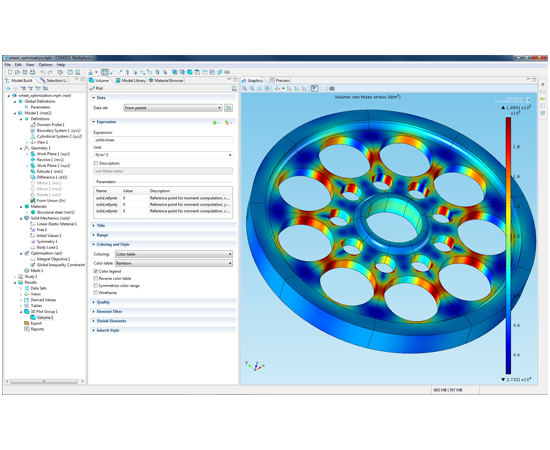 Once you have created a COMSOL Multiphysics model of your product or process, you always want to improve on your design. This involves four steps. First, you define your objective function – a figure of merit that describes your system. Second, you define a set of design variables – the inputs to the model that you would like to change. Third, you define a set of constraints, bounds on your design variables, or operating conditions that need to be satisfied. Last, you use the Optimization Module to improve your design by changing the design variables, while satisfying your constraints. 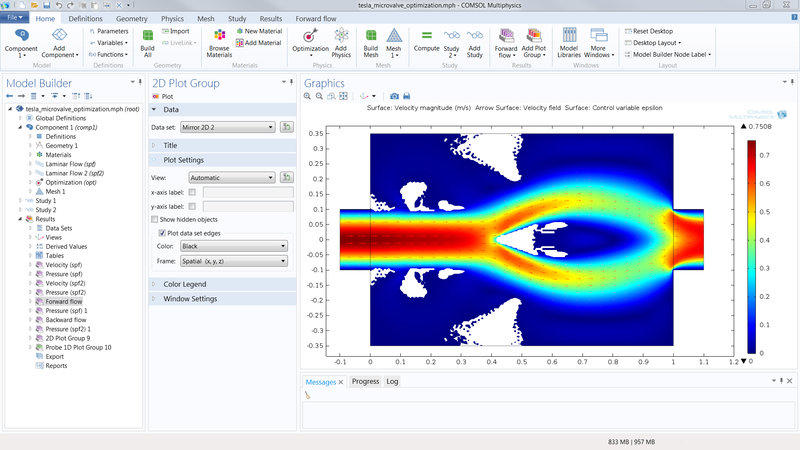 The Optimization Module is a general interface for defining objective functions, specifying design variables, and setting up these constraints. Any model input, whether it be geometric dimensions, part shapes, material properties, or material distribution, can be treated as a design variable, and any model output can be used to define the objective function. It can be used throughout the COMSOL Multiphysics product family and can be combined with the LiveLink™ add-on products to optimize a geometric dimension in a third-party CAD program. OPTIMIZATION OF A FLYWHEEL: The optimization of the hole sizes of a flywheel is completed with the objective of minimizing the mass of the wheel. The hole sizes are the design variables and there is a constraint on the peak stress. As the hole sizes change, the location of peak stress occurs at different points. The derivative-free method is used to solve this optimization problem. SHAPE OPTIMIZATION OF A HORN ANTENNA: An initially straight-sided acoustic horn is optimized to improve the far-field sound pressure level. Shape optimization is used to arrive at the undulating corrugations of the horn. CURVE FITTING OF A HYPERELASTIC MATERIAL MODEL: Curve fitting (parameter estimation) of two parameters that define a nonlinear Mooney-Rivlin material model in solid mechanics to measured data. CHEMICAL REACTORS: A chemical solution is pumped through a catalytic reactor where a solute species reacts in contact with the catalyst surface. The model aims to maximize the total reaction rate of the solute for a given total pressure difference across the bed by finding an optimal catalyst distribution. Shown is the catalyst distribution (as the height), direction of flow (streamlines), and concentration distribution (color plot). A TESLA MICROVALVE: The material distribution inside of a microfluidic device is adjusted to minimize the pressure drop if the fluid flows from left to right, and to maximize the pressure drop if the fluid flow is reversed. The Optimization Module includes two different optimization techniques: Derivative-Free and Gradient-Based optimization. Derivative-Free optimization is useful when your objective functions and constraints may be discontinuous and do not have analytic derivatives. For example, you may want to minimize the peak stress in your part by changing the dimensions. However, as the dimensions change, the location of the peak stresses can shift from one point to another. Such an objective function is non-analytic and requires a derivative-free approach. Five such methods are available in the Optimization Module: the Bound Optimization by Quadratic Approximation (BOBYQA) method, the Constraint Optimization by Linear Approximation (COBYLA) method, the Nelder-Mead method, the coordinate search method, and the Monte Carlo method. The Optimization Module will compute an approximate gradient to evolve the design variables towards an improved design. You may want to minimize the total mass of your part which can also be done using this approach. The mass of the part is usually directly differentiable with respect to the part dimensions, permitting use of a gradient-based approach. The Optimization Module will compute the exact analytic derivative of your objective and constraint functions using the adjoint method of the SNOPT optimizer, developed by Philip E. Gill of the University of California San Diego and Walter Murray and Michael A. Saunders of Stanford University, to improve the design variables. A second gradient-based algorithm is a Levenberg-Marquardt solver. You can use this solver when the objective function is of a least-squares type, typically for parameter estimation and curve fitting applications. A third method, the Method of Moving Asymptotes (MMA), is a gradient-based optimization solver written by Professor K. Svanberg at the Royal Institute of Technology in Stockholm, Sweden. It is designed with topology optimization in mind. The method is called GCMMA in the literature and is available in the Optimization Module under the name MMA. The advantage of the gradient-based method is that it can address problems involving hundreds, or even thousands, of design variables with very low increase in computational cost as the number of design variables increases. The Adjoint method simultaneously computes all analytic derivatives, whereas the derivative-free method has to approximate each derivative, and will take more time as the number of design variables increases. The gradient-based methods can also include more complex constraint functions. The advantage of the derivative-free method is in its simplicity. It does not require finding a differentiable objective function, and it requires less user interaction to set up. However, due to the computational costs, derivative-free methods are most attractive when the number of design variables is around 10 or less. 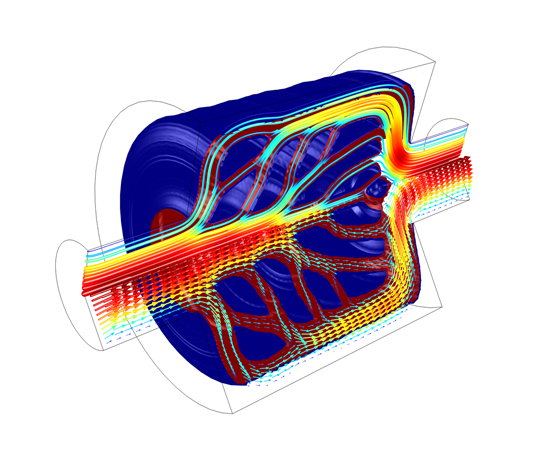 In practice, this covers a wide range of practical engineering optimization problems. Parameter Optimization involves optimizing any scalar input to the model, such as flow rates and load magnitudes. This is usually the easiest kind of optimization and can be addressed with any technique. 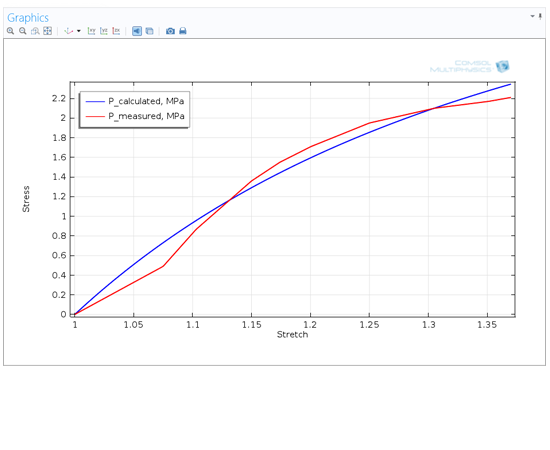 Parameter Estimation is more complex, and involves correlating a COMSOL model to experimental data. Typically, the objective is to use a model to estimate material properties used. Optimization methods can be further classified by the types of variables being optimized. Dimension, Shape, and Topology optimization are all addressed within the Optimization Module, and each has its own place in the design process. Dimensional optimization involves defining design variables that can be directly translated to manufacturing. Typical design variables may be hole sizes, or length, width, and height of structural members. Dimensional optimization is usually used as the last step in the design process and is performed once the design is more or less fixed in terms of the overall shape. The derivative-free method is usually used here. Shape optimization typically occurs earlier in the design process, and involves a more free-form alteration of the object. More care is usually required for choosing the design variables, as the objective is to improve the shape without over-constraining the design. The gradient-based method is preferred if an analytic objective function can be found. Topology optimization is used very early in the design process, typically in the conceptual stage. Topology optimization treats the distribution of material as a design variable and inserts or removes structures to improve the objective function. Due to the high number of design variables, only gradient-based optimization is practical.